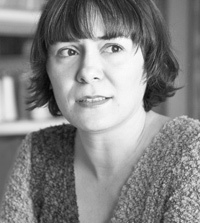 When not translating the Romanian poetry of Nobel Prize winner Nichita Stanescu or French literature, Montreal-based Oana Avasilichioaei-the most vowel-rich name in Canadian literature-used Vancouver's Hastings Park (PNE grounds) as her focus for feria: a poempark (Wolsak & Wynn $17), an oblique examination of the legacy of George Black, a little-known settler who purchased land for a slaughterhouse in 1869. 978-1-894987-29-5. It was followed by We, Beasts (Wolsak & Wynn, 2012). A third book of poetry, Limbinal (Talonbooks 2015) is a complex mixture of world politics such as globalization, the fallout of nationalistic impulses, conflicts arising out of rigid entrenchment, and the blurring lines between public and private. On a writerly level, it also explores the zone encountered when the poetic imagination encounters the materiality of its practice.